Episode20 of Inside BU Hockey features Bernie Corbett’s interviews with Head Coach David Quinn, freshman defenseman Dante Fabbro and former BU blueliner Jon Coleman. Fabbro, who has 16 points (5G, 11A) and has been whistled on five times for penalties, was drafted in the first round of the 2016 NHL Entry Draft—17th overall—by Nashville. He spent the past two season with BCHL Penticton, helping the Vees to the 2015 Fred Page Cup and earning Best Defenseman honors last season after leading all BCHL defensemen in scoring with 67 points. Earlier this season, he won a silver medal with Team Canada at the 2017 World Junior Championships. 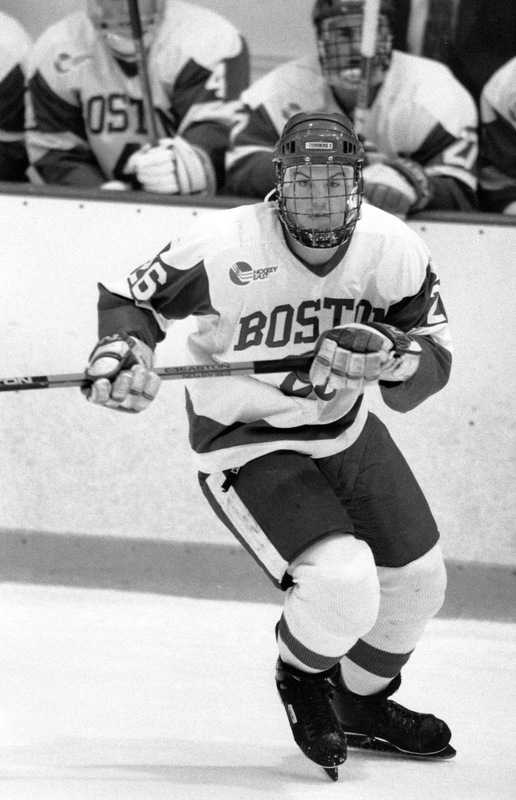 A two-time first-team All American and two-time Hockey East All-Star, Coleman is one of the highest scoring defensemen in program history, score 116 points during four seasons (1993-97). He played on Frozen Four squads each season, including the 1995 national champions and 1997’s “few good men” team (video) that reached the NCAA title game. A Detroit draft pick, Coleman spent several season in the AHL before beginning a long career in Europe with stops in Russia, Austria, Germany, Italy and the UK. ►Freshman netminder Jake Oettinger is one of ten semifinalists for the 2017 Mike Richter Award, given to the top NCAA goalie. In 30 starts, the Lakeville, Minnesota native has a 2.07 GAA and .927 save percentage. ●Let’s Play Hockey.com report on semifinalists. 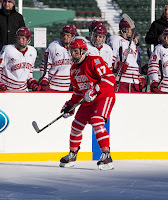 ►The Boston Hockey Blog reports that defenseman Brandon Hickey, who sat out the Notre Dame series with an injury, has been practicing and will be in the line-up tomorrow night. Nikolas Olsson remains sidelined, recovering from a leg injury. 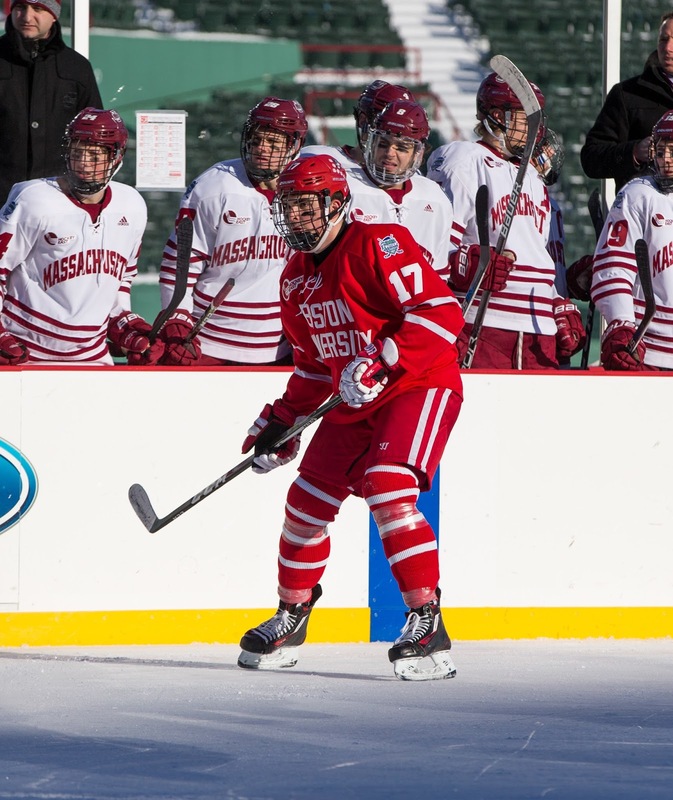 ► College Hockey News previews the four Hockey East quarterfinal series. ► Game 2 of the BU-Northeastern quarterfinal series will air on NESN in New England and nationally on American Sports Network. List of stations carrying ASN. SB Nation takes a crack at predicting the soon-to-be-announced 2017 NTDP Evaluation Camp roster. There are six BU recruits—two forwards and four defensemen-- on SBN's 44-man list. Nick Bonino recorded a hat trick—his first since 2013—as the Penguins thrashed Winnipeg, 7-4. Bonino scored his 10th goal in the first period, followed by a pair of power play tallies in the second period. The veteran center, now in his second season in Pittsburgh, has 28 points. Former Terrier captain Bill Hinch passed away on March 1st at age 71. A strong two-way defenseman who racked up 65 points over three seasons, Hinch led Coach Jack Kelley's 1968-69 squad, which featured numerous Terrier standouts, including Mike Hyndman, Herb Wakabayashi, Steve Stirling and Larry Davenport. As a sophomore, he scored 19 points for the 25-4-1 BU team that reached the NCAA championship game and that also played a legendary 3-3 double overtime tie in a contest matching then #1 BU and #2 Cornell.